To read about our history from the 1897 edition of the Charleston Year Book, click here. Saint Mary of the Annunciation, established in 1789, is the mother church of Catholicism in the Carolinas and Georgia. A compact and beautiful Greek Revival church building, the church is situated in the midst of Charleston’s bustling and historic shopping district, standing as a sturdy witness to the eternal truths of the Gospel. In its nearly two hundred and thirty year history, Saint Mary’s has exhibited a tenacity and a faith in the Holy Spirit that have enabled the parish and the church building to rise above both natural and human disasters. In the late 18th century, there were few Roman Catholics in Charleston, and those who lived in the city — vastly outnumbered by Protestants, and barred from holding elected office — were generally reluctant to identify themselves publicly. In 1786, however, a European ship bound for South America put into port in Charleston harbor to avoid bad weather. An Italian priest on board offered Mass in the house of a local Irish Catholic for a congregation of about a dozen people. Generally thought to be the first celebration of the Mass in Charleston, this one act slowly engendered confidence within the small community of Catholics and their numbers began increase, growing to nearly two hundred by the end of the decade. In 1788, the Right Reverend John Carroll (then Prefect Apostolic of the United States) sent to Charleston the Reverend Matthew Ryan, a priest of the Diocese of Dublin, who found the Catholics there still to be “few, poor, and timid.” Father Ryan rented a wood frame meeting house on Hasell Street that had used by a sect of Calvinistic Methodists, and began to organize a parish. Within two years, however, he left Charleston because of ill health. Near the end of 1789, Bishop Carroll (by now Bishop of Baltimore, the first U.S. diocese) appointed the Reverend Doctor Thomas Keating to replace Father Ryan. During his tenure, the property on which the parish had been worshiping was procured permanently, purchased at auction, for 460 pounds and 3 pence sterling, by five parishioners serving as trustees. It was Father Keating who named the parish Saint Mary of the Annunciation, in honor of the Mother of Christ. Like his predecessor, Father Keating also fell victim to illness, and within three years departed Charleston and St. Mary for Philadelphia, where he died of yellow fever in 1793. Saint Mary’s third pastor was Father Simon Felix Gallagher, a priest of the Diocese of Dublin and graduate of the University of Paris, whose signal achievement as pastor was to replace the wood frame building with a more solid brick structure. During this period, Saint Mary became home to many refugees fleeing to the United States from the native uprisings in the French colony of Santo Domingo. Among these were the five children of Admiral de Grasse, the French naval officer who blockaded Cornwallis at Yorktown during the Revolutionary War; two of the five are buried in the Saint Mary cemetery. The new church opened with solemn Benediction in December of 1806, after five years of planning and construction. In 1810, fissures opened in the relationship between the clergy leadership and the lay trustees of Saint Mary when the latter adopted a set of rules that essentially deprived the pastor, Father Gallagher, of his authority. As a few truculent and misguided souls continued to defy the authority of the Catholic Church, the whole parish suffered. In 1816, Archbishop Neale of Baltimore replaced Father Gallagher with Father Pierre J. de Cloriviere (who escaped from Paris after being associated with an assassination plot against Napoleon), but the impasse was not broken. The Archbishop put the church under canonical interdict, essentially shutting it down as a consecrated place of worship, and Father de Cloriviere secured a chapel at the corner of Cannon and Ashley for parish sacraments and services. Greatly burdened by the estrangement within the parish, Father de Cloriviere at last prevailed upon the Archbishop to accept his resignation, and finished his days as Director of the Visitation Convent in Georgetown in Washington, DC. Father Benedict Fenwick, S.J. arrived in Charleston in 1818, accompanied by his assistant, Father James Wallace, S.J., with instructions to re-open the church as soon as the Trustees demonstrated their willingness to submit to the Church’s authority. Two years later, in 1820, Pope Pius VII erected the Diocese of Charleston and named John England its first bishop. Recounting the reconciliation that eventually took place, Bishop England observed, “By the prudent administration, the zealous discharge of every duty, and the conciliating manners of these gentlemen, and by removing some of the cases of previous irritation, the people were re-united, the church re-opened, and the Sacraments again regularly approached by many who had been long absent.” Saint Mary was restored to full status in 1824, and the process of healing and renewal began. The schism was over. Having survived the man-made disaster caused by human obstreperousness, Saint Mary had yet to face the ravages of fire and war, but these both occurred before the century was out. In April of 1838, Charleston endured the Great Fire, a conflagration that claimed nearly two-thirds of the city. Saint Mary and its neighbor, Kahal Kadosh Beth Elohim Synagogue, were both totally destroyed. Encouraged by Bishop England, however, and bolstered by the generosity and sympathy of people from all around the United States, the parishioners immediately set about rebuilding. The cornerstone of the present church, built by Mr. Christopher Kane, was laid shortly thereafter on the Feast of the Assumption, August 15, 1838. St. Mary’s was reopened for Divine Worship on June 9, 1839. Twenty-five years later, the Civil War brought considerable bombardment of the Charleston peninsula by Union forces in 1864. One Union shell destroyed the Henry Urban organ in the rear balcony while another damaged the left front of the church exterior. Numerous other shells obliterated gravestones and caused other minor interior damage. Subsequently, Saint Mary escaped three noteworthy natural disasters with only minor damage: the Charleston earthquake of 1886, the great hurricane of 1893, and Hurricane Hugo of 1989. Rebuilt in the Greek Revival style after the Great Fire of 1838, Saint Mary is distinguished by the temple-style pediment on its gable-front roof which is supported by four Ionic columns. The church is entered through a portico. The height and width of the church’s interior are proportionate, imparting to visitor and worshiper alike a sense of harmony, balance, and beauty. Over the main altar hangs a painting of the Crucifixion by John S. Cogdell, painted in 1814. Severely damaged in the fire of 1838, it was completely repainted on the same canvas by the artist, a member of Saint Michael Episcopal Church who was both a great friend of Saint Mary and a companion of noted artist and inventor Samuel F. B. Morse, who lived in Charleston and painted a portrait of Bishop John England. The twenty-three paintings that adorn the church are copies of masterpieces and were rendered by Caesare Porta of Rome. Among these, tucked away in the northwest balcony, is a portrait of Saint Peter with six toes on his right foot. The large central painting of the Assumption of the Virgin was placed in the memory of Dr. James A. Corcoran, who served the parish briefly in the mid-1840s by several priests he had taught in the Philadelphia Theological Seminary. The stained glass windows portray various Biblical scenes and were donated by some of Saint Mary’s longstanding and prominent families; they are from the famed Mayer Glassworks in Munich. The church has a crowded graveyard of local interest. Predominant inscriptions are written in Latin, French and English. Seventeen nationalities are represented spanning two centuries and three continents. 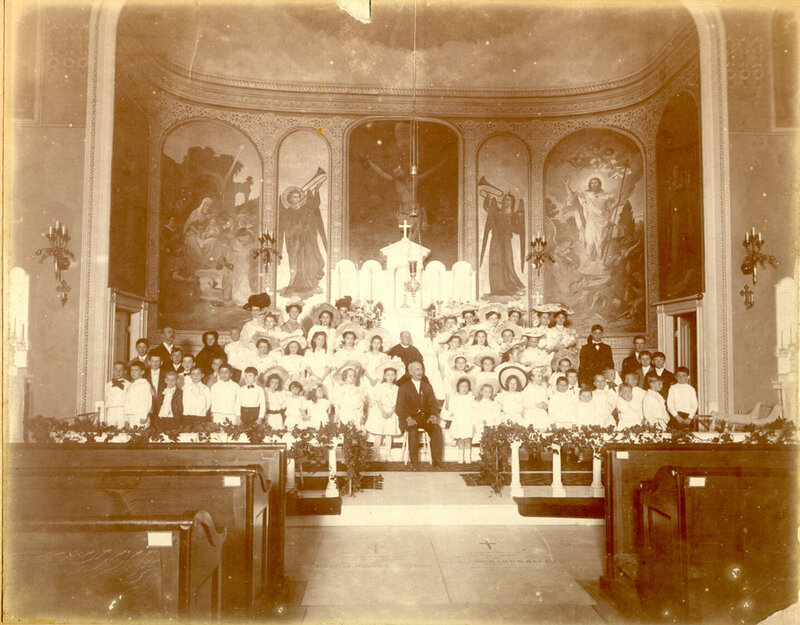 In 1896, parishioners undertook a restoration effort for the church. The main altar and sanctuary were donated by Mrs. Louis Storen and Mrs. Theodore Wilbur, in memory of their parents, Mr. and Mrs. George C. McNulty, and were erected on March 25th of that year. The Sacred Heart altar was given by the family of Henry Oliver. The Blessed Virgin altar was donated by Mary J. Powers, in memory of her parents, Mr. and Mrs. James Powers, in 1905. Today, the members of Saint Mary Parish constitute a small and vibrant faith community, led by the Reverend H. Gregory West, Pastor, and the Reverend Patrick Allen, Parochial Vicar. The parish is proud of its long and varied history, yet also looks to the future as it does its part to bring about the kingdom of God in Charleston, South Carolina. St. Mary’s Church by Rev. Thomas F. Hopkins, D.D.. Published in The Year Book of Charleston, 1897. Will of Rev. G.P. Bournonviviere, proved Nov. 27, 1801, Charleston County Probate. St. Mary’s Family Year Book, 1913-14. City Gazette, August 15, 1793. Our Catholic Roots – Old Churches East of the Mississippi by Walter H. Maloney. In the Beginning - St. Mary’s Church. Charleston. South Carolina 1789-1989. Researched and Edited by Florence Marie Hennessy, MA, Catholic University of America. History by Agatha Airnar Simmons. Brochure text edited & updated 1996 by W. Thomas McQueeney and in June 2001 by Msgr. Chet Moczydlowski. Special Thanks to Msgr. John A Simonin and to Mrs. Jervey D. Royall.